of anatomy with clinical correlations throughout. 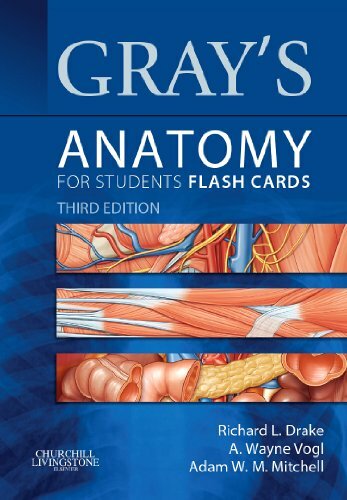 Discusses the relevance of surface anatomy to clinical procedures and physical examination techniques.Relates regional anatomy to systemic function.Features beautiful full-color anatomic illustrations as well as radiologic images.Includes page references to Gray's Anatomy for Students, 2nd Edition to make further study easy.Comes in a convenient 4" x 6" format.Presents the perfect review tool for course exams as well as the USMLE Step 1 that lets you study your way based on your own personal study habits.Provides flash cards online at www.studentconsult.com, so you can consult them anywhere you go.Features "wiring diagrams" that detail the innervation of nerves to organs and other body parts to explain key concepts for a clear, visual review.Presents new "Muscle" cards that cover functions and attachments offer a full range of anatomical concepts. Includes select images from Gray's Atlas of Anatomy, offering further clarification of anatomical structures and functions.